After viewing the graphic of their home page or visiting their site, you may think I’m being sarcastic. But I swear I’m not. OK maybe a little, but not much. Because despite the fact that I make my living producing and designing websites and other collateral for online marketing, after pondering this site for some time I realized that I could not improve upon this website. Yes, I could make it look prettier. I could add functionality. I could re-platform it with a CMS. I could go to Getty Images and purchase stock photo assets featuring 20-something women in business suits standing in office suites talking on their smartphones, and put those images into jQuery slideshows on the home page. The site has it all: Relevant content for the investors like company address, contact info, as well as other content of interest like annual stockholder letters from Chairman Warren Buffett dating all the way back to 1977. Online marketing? 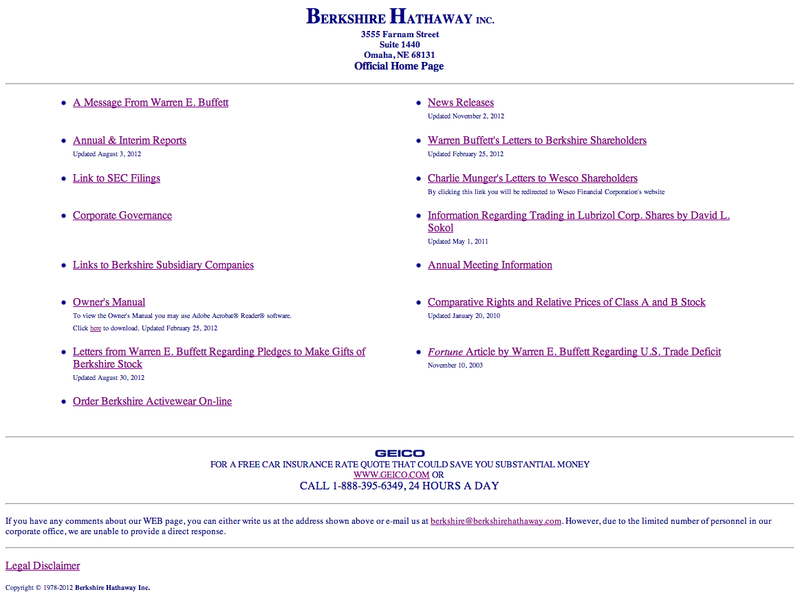 Got it covered – linking from the bullet-pointed text on the home page is a landing page containing a plug for Geico Insurance (a Berkshire Hathaway holding) from the chairman, displayed in wonderful single-spaced Times Roman. What more do a couple of billionaire octogenarians and their stockholders need? Not believing for a minute that, in a world full of money-hungry design firms, I could be the only person contemplating the stark nakedness in the design of a website that is the online face of a corporation whose assets are somewhere in the neighborhood of $250bn, I googled queries targeted to find discussions about the phenomenon and found quite a few. Comments about the site’s er, spartan design range from thoughtful to abjectly disgusted. It seems beyond the comprehension of many web designers that a business doesn’t feel the need to commission a website featuring dozens of Ajax forms with headings stylishly laid out with the latest in server-side fonts. How dare B-H not upgrade their primitive website since 2003? And that horrid excuse for a logo – Oh, the humanity! But what about attracting customers with professional-looking design and elegantly presented content? Well, any investment group whose Class A stock is priced at around $125,000/share will do just fine without websites to promote their business, thank you very much. As far as branding goes, any organization that acquires stakes in businesses solely for investment purposes needs no branding; indeed, branding visibility of an investor with a large stake in a particular corporation could very well taint that corporation’s brand value. But the absolute genius in not developing a new website for Berkshire Hathaway is this: Any new site dev or major changes to the existing would have to be approved by CEO Warren Buffett and Vice Chairman Charlie Munger. And based on last year’s earnings, their time comes in at around $30,000 per hour (each). Which means that even the most cursory review and approval of agency work will see an instant net loss of around $20k for them just to look at it. Put another way: I figure that in the time it has taken me to write this post and get it online, Warren and Charlie made around $85,000. So the only thing I learned about UXD/UI design in the above exercise is that clearly I’m in the wrong business.